Complex systems are characterized by an abundance of meta-stable states. This is the case for granular materials, that can flow until one jammed configuration (among the exponentially many possible ones) is reached. I will argue that at least in popular simplified models of granular materials, these dynamically-accessible configurations are stable, but barely so. 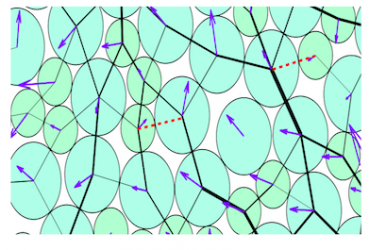 Such marginal stability offers a new perspective on both the solid and the liquid phase. I will discuss dense suspensions and propose to describe flow as a gas of elementary excitations, corresponding to the opening and closing of contact between particles. This approach leads to a detailed scaling description of rheological properties and length scales of dense flows. If time permits I will discuss a classification of athermal glassy systems based on the stability of low-energy excitations. Matthieu Wyart is associate professors of Physics at New York University since 2014, where he started as Assistant Professor in 2010. He received the Sloan fellows award 2011 and he is Simons Investigator since 2015.